I have a habit of keeping things that are going to be gone soon. And once I have kept the object, I end up forgetting about its existence until it’s gone. Such is the case when the five- and 10-peso banknotes were slowly removed from circulation. I kept the bills in an old box of chocolates and forgot about it until they were nowhere to be found. If ever I’ll see them out of the blue, they wouldn’t have the same value they had years ago. It’s a common occurrence to place money somewhere, forget about it, and find it when you need it the most. Imagine that happening this Christmastime, but what if you find old-generation or the 1985 banknotes that are already deemed useless? The good news: Bangko Sentral ng Pilipinas (BSP) is kind enough to make it valuable again. 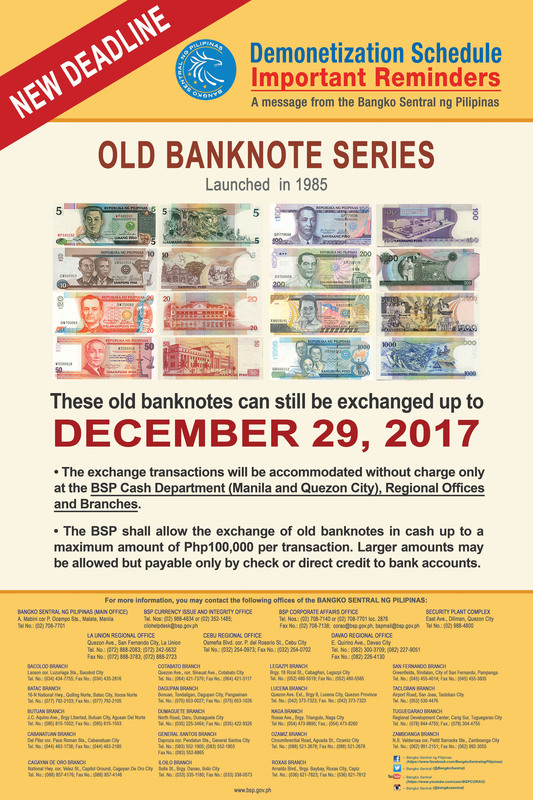 BSP is extending the deadline of swapping old banknotes for new ones on Dec. 29. The old-generation bills were supposedly rendered useless in January of this year but after an uproar from the public, they decided to move it on Mar. 31 which was then moved again to June 30. After hearing out the public (including overseas Filipino workers), the deadline was finally scheduled on Dec. 29. In a report from the Inquirer, the BSP will allow a maximum of P100,000 per transaction. Higher amounts, on the other hand, may be payable by check or direct credit to a bank account. Transactions for the swapping of old banknotes will be done at any BSP cash department, branches, and regional offices. Since the deadline has been extended numerous times already, this may be the final deadline to get the value of those old peso bills. So, start searching the nooks and crannies of your home and you might find treasure before it’s too late. Why do we collect things?